The majority of the various types of barley are whole-grain foods that contain the protective bran, endosperm and nutrient-filled germ. Some barley products, however, are not true whole grains, since some of the components are removed during processing. No matter which type of barley you select, rest assured that they're all low or moderate on the glycemic index. The glycemic index or the GI, is a list of foods that contain carbohydrates. Generally, the higher the glycemic index rating, the more likely it is that the food will increase your blood glucose levels. Typically, foods that have a GI above 70 are heavily processed foods and often lack fiber; sometimes, they're also full of sugar. These factors contribute to that sudden surge in your blood sugar. Medium-range glycemic-index foods that have scores of 55 to 69, as well as low-glycemic index foods that have scores below 55, will also elevate your blood sugar. But these types of foods, including barley, make your glucose go up slowly and over a long period of time, and then let it drop back down gradually. You aren't as likely to get those blood-sugar spikes from medium- and low-glycemic foods. Pearled barley, which is not a whole grain since much of the outer bran layer has been removed, has a GI rating of 22 to 29. After boiling it for an hour, you'll lose some more of the fibrous husk, and the GI goes up a bit to 35. Rolled barley flakes made from pearled barley, which are similar to rolled oats, can have a GI rating as high as 66. Hulling barley only removes the rigid, inedible part of the husk, leaving the bran intact so that it is still a whole grain. The kernels that remain have a GI rating of 20 to 22, even after cooking. 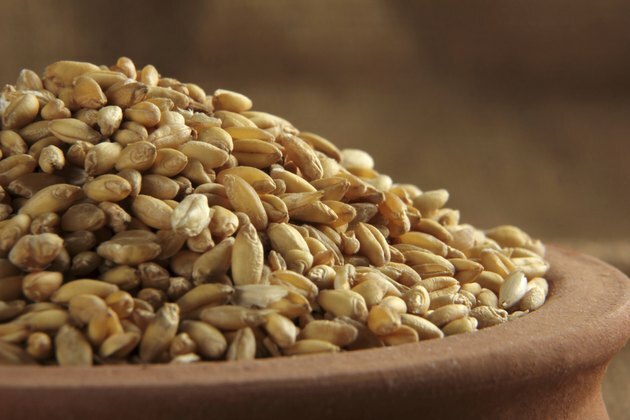 Additionally, once barley kernels are cracked in half, they're no longer considered a whole-grain food. Cracked barley has an average GI score of 50, prepared or raw, which is still on the low end of the spectrum. While the majority of whole grains are packed with insoluble fiber, which helps improve regularity, barley is particularly rich in soluble fiber. In your digestive tract, fluid blends with soluble fiber, creating a gel-like formula that slows digestion. As the sludge creeps through your gut, it delays sugar absorption through your intestinal walls. This perk of soluble, fiber-rich barley is the primary reason it rates so low on the glycemic index. What Are Some Low Glycemic Cold Cereals? What Is the Difference Between Oat Bran & Whole Grain Oats?